Use my fixes to use JMonkeyEngine 2.0 with JOGL, it is then quite stable. 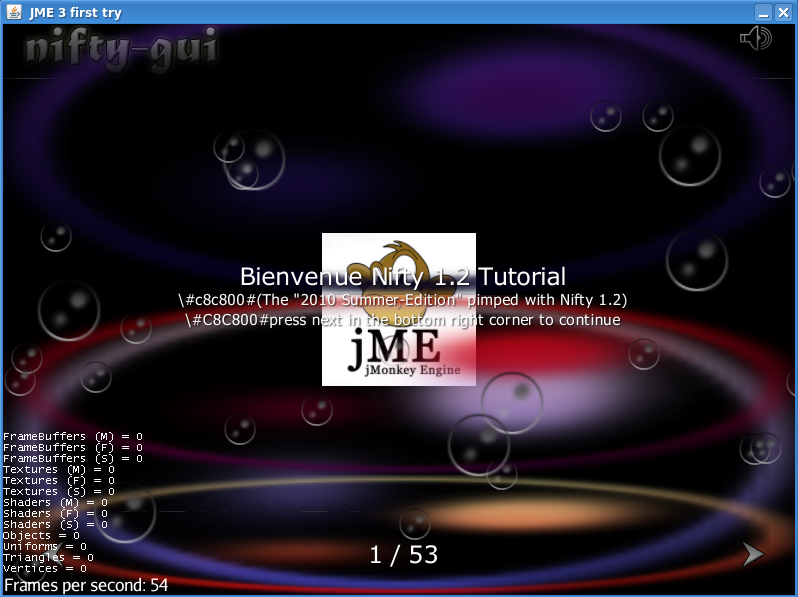 I have fixed a lot of bugs in the JOGL renderer of JMonkeyEngine 3 and I have ported it to JOGL 2. The source code will be committed in a few days. I have only one strange bug with my quick port of Ardor3D to JOGL 2, I did not succeed in reproducing it with a shorter test case. The context is null when I try to create an external context. As far as I know, jzy3d still uses JOGL 1.1.1a. I might port it to JOGL 2 before January if I have enough time. 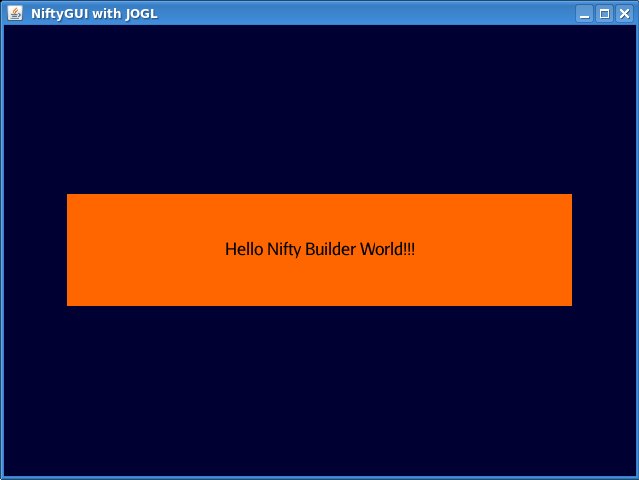 If the NiftyGUI Java2D renderer is not enough for me, I might plan to port NiftyGUI directly to JOGL 2. Currently there is no JOGL renderer for this API. Great work! The more code bases are using JOGL 2, the better tested it will be. I hadn't heard of the JMonkeyEngine before -- I'll go check it out once your commit is in. The guys who wrote this renderer gave up, the source code is dirty. I made my best. BAD NEWS: The JMonkeyEngine team plans to drop JOGL support. I'm sorry, I did my best, my attempt was a "work in progress" thing but they decided not to maintain 2 renderers. Sorry to hear that. But it was worth a try! Ardor3D is far better and more reliable than JMonkeyEngine. Did they give any reason for that? It uses the version of JOGL 2.0 beta that is on the Sven's GIT repository. Not sure if you've looked at Processing.org, but Nifty GUI would be a nice addition to the GUI interfaces. At this time, Processing runs on JOGL 1.1.1, but I'm sure we'd love to get it to JOGL 2.0. Does someone already plan to port Processing to JOGL 2? 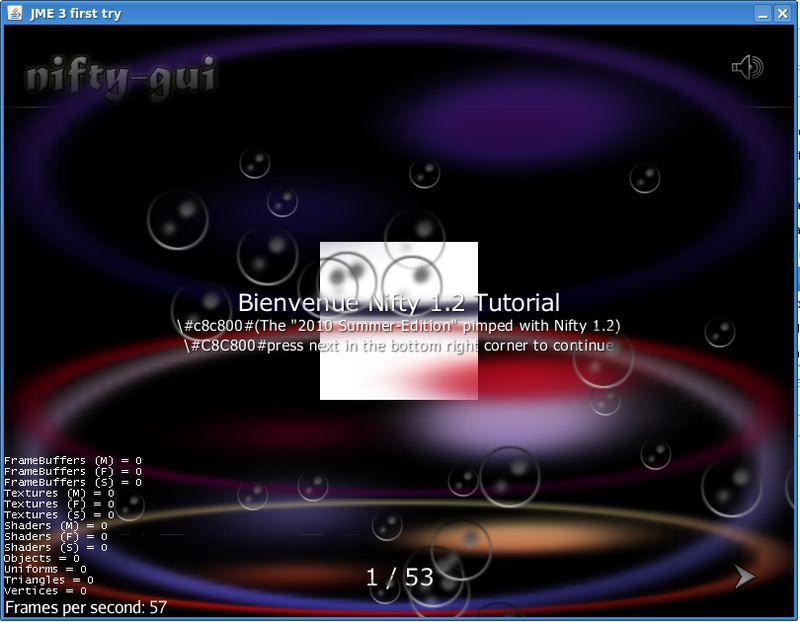 Only a few things do not work in the JOGL version of Nifty GUI (I remind that Nifty GUI was even not supporting JOGL 1.1.1a before I began using it). Yes, there are plans to update it to JOGL 2. Not sure what the schedule is... or when JOGAMP plans to release 2.0 for that matter. I'm currently using Ardor3D with the last JOGL 2 code base. I had planned on submitting this back to Ardor, but we are currently using a GLEventListener based model instead of Ardor's Canvas and FrameHandler framework. It works well and uses an Animator to control the animation. To unsubscribe from jogl, click here. Why do you use GLEventListener instead of Ardor's Canvas and FrameHandler framework? Does your port use NEWT or AWT? We were targeting NEWT, and found it much easier to just let the windowing system manage resources. 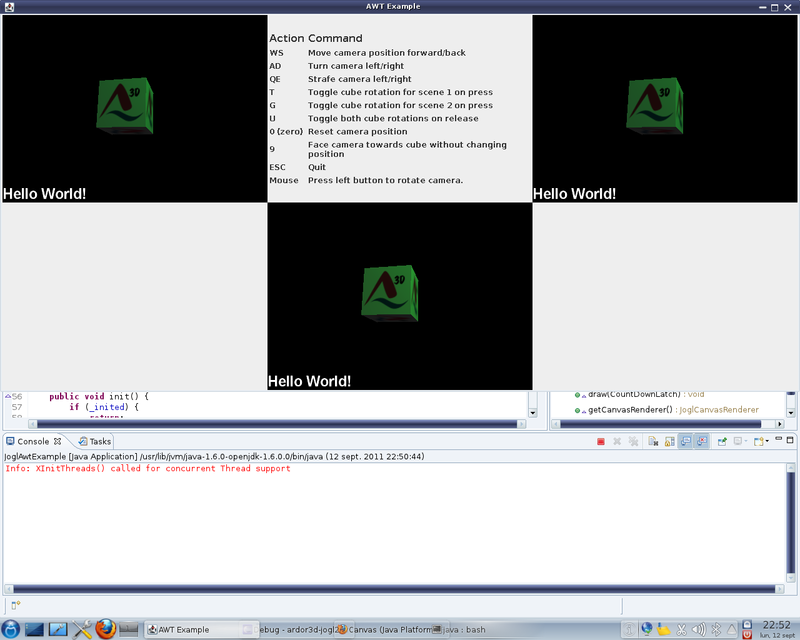 A GLEventListener which rendered an Ardor3D scene would work with anything from a simple NEWT window, to a GLJPanel. The GLEventListener is notified about changes in the GLWindow's life cycle. init() doesn't get called until the resource is ready for initialization. destroy() is called regardless of the manner in which the process is initiated. FrameHandler didn't seem to provide any benefit over simply using an Animator. FrameHandler doesn't handle Updater and Canvas instances added after it is initialized, while GLWindow always ensures that init() and reshape() are called before the first display(). We wanted the ability to add and remove an Updater at any point. The FrameHandler doesn't provide any structure. If you want to ensure that updateGeometricState is called after all updates, then you have to provide some other mechanism (e.g. look at the examples provided in ardor3d-examples). Since Ardor3D doesn't support updates while rendering is occurring, it really is just a loop over the serial phases of update and render. Ok it is very nice :) but I don't know whether your port will be integrated as is as you don't use FrameHandler. Have you ever tested it on Linux? > windowing system manage resources. > with anything from a simple NEWT window, to a GLJPanel. > the process is initiated. > ability to add and remove an Updater at any point. ie. an orthogonal toolkit approach besides the 'official solution'. If not hosted within their codebase, we may be able to host it as a plug-in. Maybe Ardor3D should use my JOGL 2 port (that relies on AWT) and that uses FrameHandler until the Ardor3D team modifies the existing framework so that snmvaughan's JOGL 2 port (that relies on NEWT) of Ardor3D can use FrameHandler. It would allow to have a working and accepted JOGL 2.0 port of Ardor3D as a first step and a more performant solution as a second step. I think the Ardor3D team wishes to keep his framework because it allows to switch easily between several Java bindings of OpenGL. snmvaughan's JOGL 2 port is better than my naive port. It has not been updated for a while but it should work with the latest build. I have just rewritten my straightforward port in about 3 hours, I will use it with TUER very soon, probably in some days.